After all this time, it's important to get the anniversary gift exactly right. Or is it? At this point in the marriage, we can be tempted to slip into that 'comfort zone'. Feeling that sense of intimacy and sanctuary is, of course, a wonderful thing, but it's also vital to keep that spark going, inject a bit of romance or - at the very least - show that your love and appreciation hasn't waned. But how do you do that? By giving a 10th wedding anniversary gift from the heart for starters. The wonderful thing about gifting a beautiful personalized photo print is that it may require some thought, but it requires little effort. Nifty huh? Whether you're a family of two or a family of five, this gift is all about celebrating that special bond that exists just between the two of you. Don't let your love lose its luster. 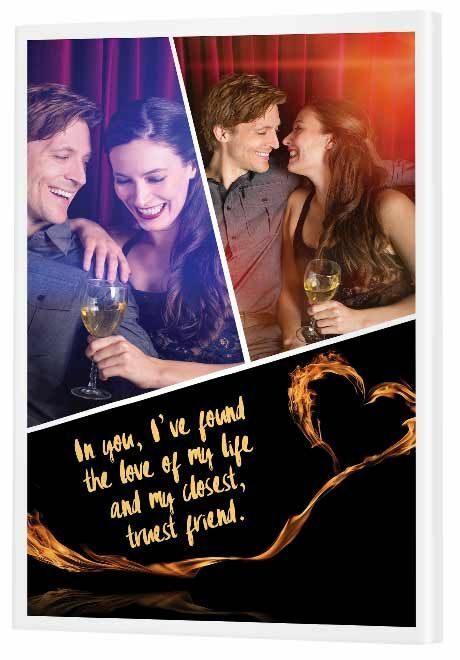 This stunning metal print will let that passion shine through. 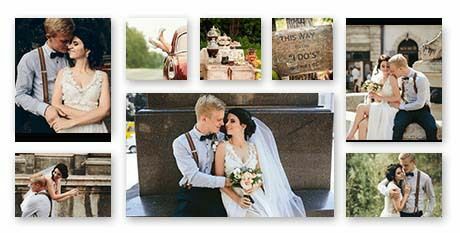 Find some photos that epitomize your love. They might be professionally shot or beautifully candid. They might feature the two of you full of laughs or looking lovingly into each other's eyes. Or even both. The key is choosing a photo that is 'all you'. The more genuine the better. This contemporary modish template features three frames. In this example we've displayed two photos at the top and used the bottom frame for a touching quote. Including a quote gives the gift an extraordinary feel, something so important for a milestone occasion such as this. The image looks impressive, doesn't it? The good news is that something like this is easy to create using Canva. All you have to do is find a background image and overlay the text. When it comes to choosing a quote, do a search online, find something that's meaningful for you and your spouse, design it in Canva then use that original image to create a dramatic gift and a divine keepsake. There are so many ways to say 'I love you' and this gift honors that dazzling diversity. A single canvas print seems simple, but don't feel you're limited to printing a photo. You can print absolutely anything you like - an illustration, graphic art, a painting. To stand out, design a fun, exciting work of art that will surprise and delight. This construction features how to say 'I love you' in four different languages. You might prefer to design something that includes 6 or even 12 different languages. If you'd like to limit it to four like we've done, perhaps think through a connection with a particular language and choose that one to include. For example, if you and your partner come from a multicultural background, you can include all the different languages based on your ancestries. 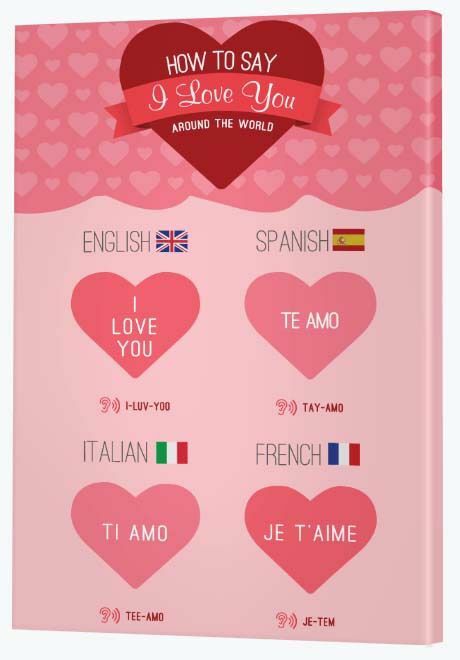 Or if you've traveled overseas you could say 'I love you' in the languages of all the different places you've traveled. That all said, your art idea might be something completely different. Despite being incredibly affordable to print, the catch with this print is that the original design has to come from you so get creative with Canva or find a family friend with a knack for design to help out. 10 years is such a significant milestone, don't forget your kids might want to organize a gift for the two of you. Dads, if you really want to amaze the love of your life, prompt your kids to give Mom a 10th anniversary gift. Getting the kids involved highlights the blessing of 10 years together. This themed canvas, with 'love' at its center is a wonderful visual arrangement. 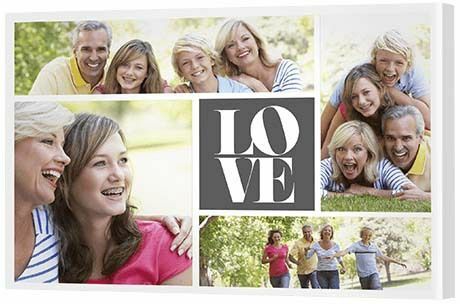 Surround love with four fantastic family photos featuring all of you together. If your fur child is part of your family, your partner will completely 'get it' when you gift this pawfect print. 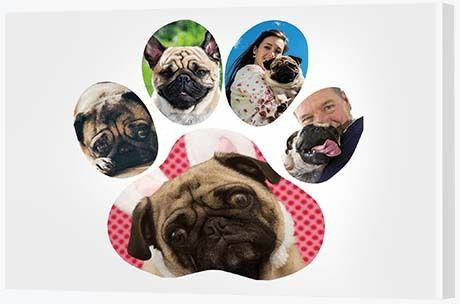 With five frames to fill, you have the opportunity here to include multiple photos of your one pet or even five different photos of your multiple pets! To step up the love, you might like to use photos of the two of you with your cherished pooch or simply give your furry friend all the glory. One hot tip when you're styling this silhouette paw collage is to zoom right in on the photo. Unlike other collages, this style of print doesn't need much scenery behind each of the frames. Better to just focus closely on the subjects. If you live for adventure, put those amazing experiences in the spotlight with a classy metal print. Beautiful brushed aluminum is far from an everyday gift. It offers something a bit extra special - a real treat. 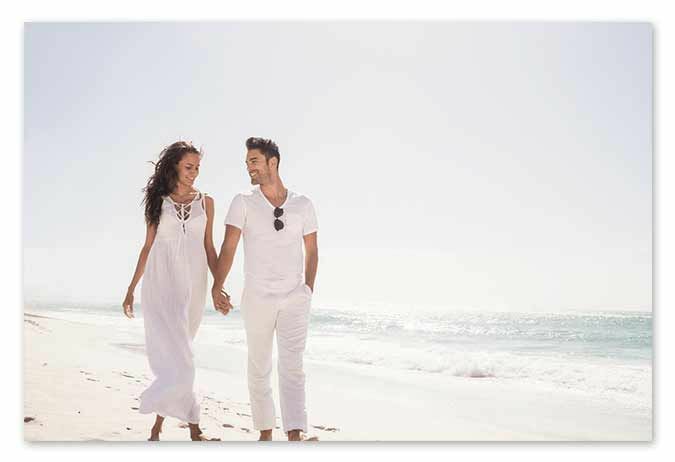 It's the ultimate material for that ultimate milestone; your 10th wedding anniversary. Metal has a strong masculine feel, making it a wonderful anniversary gift for your husband. Of course you may still choose to hang it in the living area, but it would also suit his man cave, home office or workplace office. This traditional collage template is free of fuss. It features only two frames, but in a case of 'less is more' it gives you the opportunity to include a hero shot. What do we mean by 'hero'? Basically it means the most amazing photo in your collection. That's what goes in the top frame. 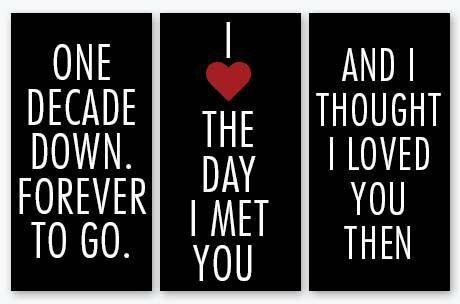 In the bottom frame you can then add an exciting, classy, arty designed quote. 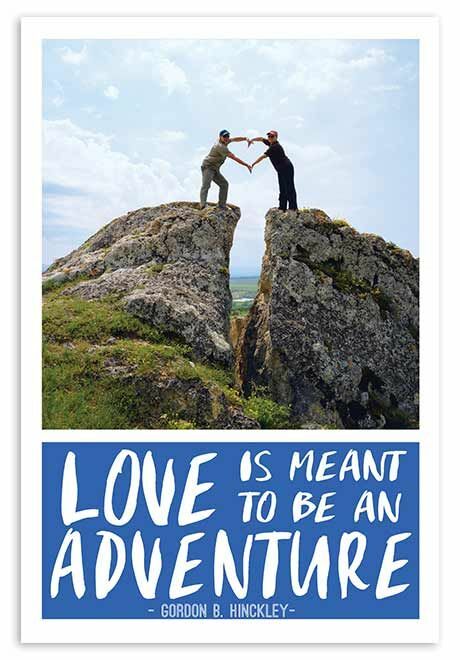 "Love is meant to be an adventure" said Gordon B. Hinkley, so celebrate that spirit now. 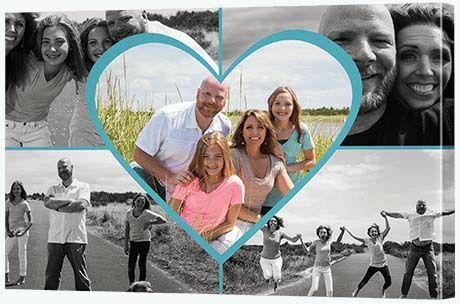 Honor 10 years of love and laughter by including fun, family photos on a print that will supply good vibes for many years to come. This modish heart collage design is fresh, fun and fabulous - a wonderful way to celebrate family. The creative possibilities are phenomenal. To create an arty, edgy feel using our CanvasApp, you can choose to remove colors from the photos completely, transforming some into black and white while leaving some in full color. You can also choose whatever border color your like, like this lively blue. While anytime is a good time to gift each other something sensational, 10 years together may give you the push you need to make it happen. Indulge your wanderlust and tickle your partner pink with a wonderful wall display featuring the best pictures of all the breathtaking places you've traveled together. This generous display gives you the opportunity to feature a photo in the middle that will take everyone's breath away. Recognize your partner's individuality with a display of love that's full of feeling, but minus the sap. A wall display on metal is a hot choice. Be even bolder by building three sensual quotes, each on a black background. Choose words that have plenty of meaning for you and your husband. There's no need to be dull and boring. Funk it up with metal. Take her breath away with an image representing the season you first met split across five fabulous frames. 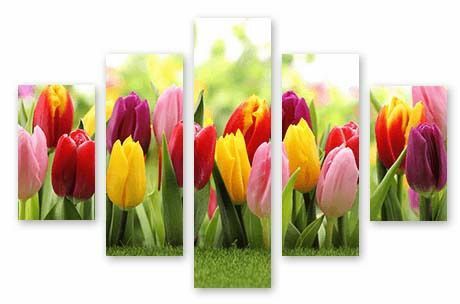 Tulips are the flowers of Spring, so if you met in Spring find a beautiful image of tulips and print it onto a stunning split image canvas to create a work of art. Choose an image from the season you met that is bright, colorful and full of life. Flowers are a perfect choice. The result is meant to be something that is pretty and uplifting; something that will brighten the walls of your home symbolizing the season your love came to life. Where did you first meet? Was it somewhere marvelous like Rome, Paris, Vienna or Tokyo? 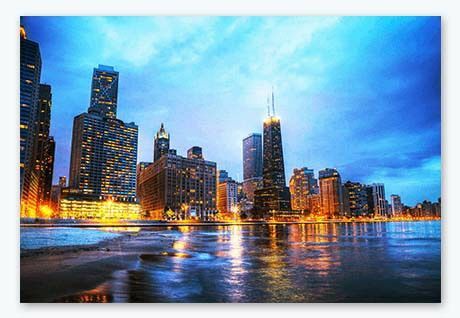 Create something wild and wonderful - a metal art print featuring the place you first met. 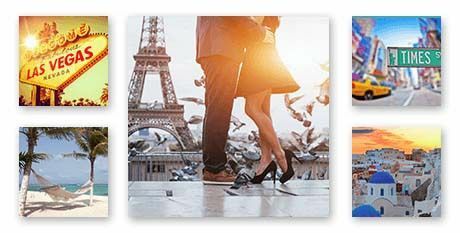 Search our Canvas Art gallery for your special city and find an image that will totally blow your hubby's mind. There's a certain je ne sais quoi about cityscape images. They have an extraordinary ability to bring a living area alive. On brushed aluminum this artistry is amplified as the picture takes on an unusual sheen. If renewing vows is not for you then why not renew the memories of your wonderful wedding day instead? This is one of those 10th wedding anniversary gift ideas that's ideal for a couple who feel it's high time to spoil themselves. In those early years, you couldn't afford an ample wall display. Now is the perfect time to treat yourself to the wonders of printing on glass.